Willoughby, Ohio, March 12, 2018 – Bevcorp LLC, a leading manufacturer of American made high-speed fillers, blenders and container handling equipment for the beverage industry, announces its acquisition of East Coast Seamers, a supplier of rebuilt Angelus, Continental and Canco can seamers and seamer service provider. This acquisition strengthens Bevcorp’s commitment to the beverage equipment marketplace, providing increased services to domestic and worldwide customers by expanding resources and capabilities in seamer rebuilding and service. Aviator Brewing paves the way for future growth with a can line that lets the craft brewer go after contract packaging opportunities. Shrink sleeve labeling plays a key role. That’s how Mark Doble, founder of Aviator Brewing Co., describes the contract packaging business model at his craft brewing establishment in Fuquay Varina, NC. Not that Aviator is losing interest in its own-brand beers like Hot Rod Red, Hog Wild IPA, and Devils Tramping Ground Tripel. It’s just that Doble believes that the path to future success in craft beer—a category that is still growing but is beginning to show signs of saturation—lies in expansion beyond one’s own brands. It also hinges on packaging. Aviator hasn’t offered bottled beer since shortly after Doble launched the brewery—in a former airplane hanger, which explains the brewery’s name—in 2008. He’s a big believer in cans as the best format for beer, partly because he does a fair bit of export business overseas. “Zero oxygen gets into a can,” he points out. “Light protection is better than glass. From a shipping perspective, the can won’t break. It’s also lighter than glass, not to mention that aluminum has a good recycling story to tell. Supplied by Labels, Tags and Inserts, the labels used originally at Aviator were a 50-micron PETG. In fairly short order the firm had moved down to 40-micron and it’s now evaluating 35-micron. Among the reasons Doble specified Axon’s Lanzara applicator is because he saw evidence that it would comfortably handle these thinner-gauge label materials, even at speeds to 400/min. The other reason? The shrink sleeve labeler replaced by the Lanzara was an Axon EZ 200 purchased about four years ago on eBay. “If we ever had any problems with that machine, the support we got from Axon was unrivaled,” says Doble, “and a big consideration in our approach to buying machinery is the quality of customer support we get. So when it came time for a new sleeve label applicator, it was a pretty easy decision whose machine it would be.” Nor did it hurt, he adds, that Axon is just down the road in Raleigh. It all begins with an overhead depalletizer from Ska Fabricating, a firm that grew out of Durango, CO-based Ska Brewing Co. As a co-owner of Ska Brewing, Matt Vincent spent a lot of time dreaming up ways of improving efficiency. He soon recognized that many other craft breweries were in need of equipment that was properly sized for craft brew volumes. So he and Dan Morris formed Ska Fabricating, whose flagship product is the Can-I-Bus Depalletizer. Designed with space and cost in mind, this is a slim-profile, semi-automatic system that’s especially suitable for craft brewers. Capable of depalletizing multiple sized packages of aluminum, plastic, or composite materials, the Can-I-Bus is fully automated once the pallet is inserted into the machine and the straps and tier frame are removed. Ska Fabricating has now sold more than 280 depalletizers around the world and continues to develop more products with space and cost in mind. At the discharge from the twist rinser is an ink-jet date coder from Domino that puts lot and date code on the bottom of each can. Then comes label application by the Lanzara. In addition to its features described above, it also takes an unconventional approach to the lighting system it relies on to communicate its operating state to plant floor operators. Most comparable machines use a light stack—typically consisting of red, yellow, green—so that operators can see if a machine is running smoothly (green), in need of attention (yellow), or stopped (red). The Lanzara, however, has shed its light stack in favor of lighting inside the machine cabinet itself. The theory is that operators have almost become desensitized to the messaging that comes from a light stack simply because they’ve been around them for so long. But when the entire interior of the Lanzara cabinet turns yellow or red, it’s pretty difficult to not get the message loud and clear. Also notable on the Lanzara is the sophisticated way its Schneider Electric controls package handles motion control where can conveying speed is concerned. Axon refers to it as “virtual encoder” technology. Here’s how it works. A Schneider variable frequency drive (VFD) regulates speed of the conveyor feeding cans into the Lanzara. This VFD constantly sends real-time can position information to the Lanzara’s main controller, a Schneider PacDrive 3. It amounts to an update every millisecond. Armed with this information, the PacDrive 3 then signals the VFD to modulate its speed if necessary so that each can is optimally positioned at the moment its label is to be applied. The PacDrive 3 also brings film-feed position adjustment in real time on the fly. 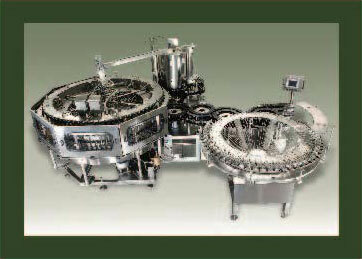 A Schneider Lexium 52 servo motor actuates the knife that cuts each label free from the roll. The instant it’s cut it’s pushed down onto a mandrel that has servo-driven nip rollers on opposite sides. These rollers not only propel the cut label down onto a can without ever losing control, they also advance the film so that the next label can be cut and applied. A clear strip between each label serves as an eye mark for maintaining registration. A contrast sensor from Tri-Tronics with a 30-microsecond response time looks for that eye mark and signals to the PacDrive 3 just where it is. If it has not been advanced to the proper position, the PacDrive will signal the Lexium 52 servo motor that governs the nip rollers to speed up or slow down accordingly. Label application is actually a two-stage process. Cans exit the first stage with labels that are pushed only about half way down. Stage two consists of rapidly spinning plastic “fingers” on opposite sides of the conveyor that quickly and efficiently push the label down to the bottom of the can. 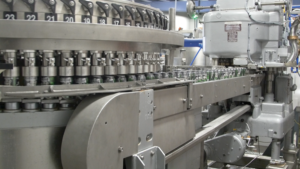 Immediately after labels are on cans, a steam tunnel shrinks each label tightly to the contour of its can. 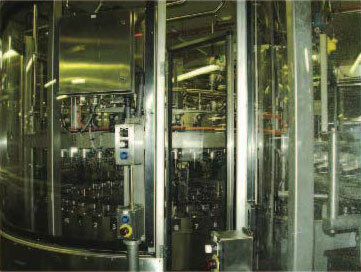 Then cans enter a 72-head rotary filler from Bevcorp integrated with a Pneumatic Scale Angelus 120L seamer. A Filtec inspection device detects any short fills so that those cans can be automatically rejected. At this point in the line cans go down one of two paths depending on which format is called for. If plastic ring carriers are in the picture, the cans are collated in groups of four or six by a Mumm 450 () that applies a ring carrier. These four and six packs go into corrugated trays before palletizing. The other scenario has cans diverted instead to a Switchback cartoner that collates cans and encloses them in a paperboard carton. This versatile machine lets Aviator do 4-, 6-, 12-, 15-, or 18-count cartons. “That’s definitely one of the things we like about it,” says Doble. For sheet metal fabricator Marlin Steel, spending money on safety technology makes dollars and sense. President Drew Greenblatt says the Baltimore, Maryland-based company invests millions in automation because it increases productivity, cuts cycle time and improves quality. It also makes manufacturing better in other ways. A non-automated company of a similar size would typically have had 18 to 30 injuries over that same span, according to Greenblatt. 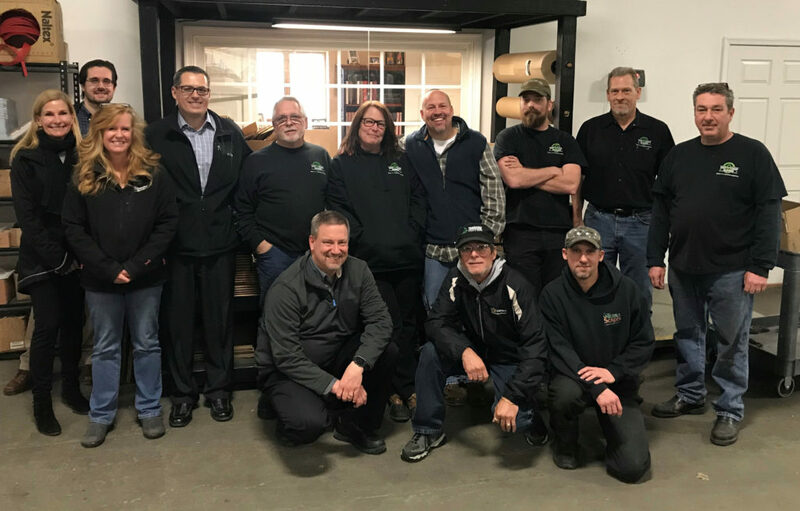 Thanks to its safety record, Marlin Steel saves money in insurance premiums and is better able to retain skilled employees, who value a company that demonstrates it values them. But, at the same time, there are aspects of safety technology that Greenblatt would like to see improved. Chief among these are alerts that warn of attempts to defeat or bypass safety systems. Another desired innovation involves better sensors and systems, largely as a means to allow humans and robots to work more closely together. As Greenblatt demonstrates, there’s a demand for safety technology, particularly if it’s part of an overall automation and productivity package. However, there also is room for improvement. Sales of safety sensors and switches will reach $3.3 billion yearly worldwide by 2020, according to a new report from analyst firm IndustryARC. The heavy machinery used in manufacturing has the potential to crush, amputate, burn or blind, causing severe workplace injuries. That makes the use of sensors a necessity to protect workers, and it explains the 3.1% compound annual growth rate in sales, says Industry Consultant Ravi Medichelmela. Willoughby, Ohio-based Bevcorp is one reason for the growth in safety-related technology. That is due to a philosophy followed by the maker of rotary fillers, blending equipment and handling parts for the beverage industry (Figure 1). “We design for safety-standard compliance, but we go above that by adding features and functionality and using the latest technologies, which gives the flexibility to maximize uptime,” says Eric Hendrickson, engineering manager for electrical and mechanical. 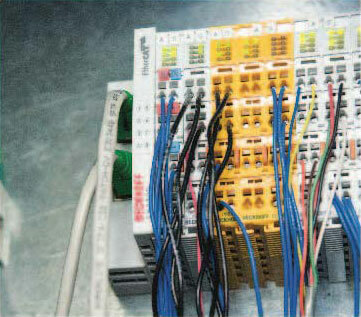 On the technology front, the company makes use of Ethernet-based safety PLCs and similar controls, finding this improves diagnostics and adds flexibility. Because of the technology, something like a door, for example, can be added without having to run so many wires. That gives the OEM the capability to better adapt a machine to a specific customer or situation. As for other design changes technology now enables, Hendrickson cites what was done with a bowl used in the filling process. The product within it has to be maintained at a certain level, with more periodically added in a foam-free fashion. Previously, a product change or adjustment required stopping a machine, opening up guarding, making a mechanical adjustment, closing up the machine and starting it up again—a time-consuming sequence that might have to be repeated. Now, an electronic level control system that sits inside the guarding and communicates wirelessly enables adjustments to be made without stopping the machine at all. Bevcorp uses products from Rockwell Automation, and Hendrickson says these offerings have evolved over time. That allows OEMs to offer more diagnostics and options. Looking forward, Hendrickson notes that safety technology vendors are trying to make devices that cannot be circumvented through the addition of redundancy and double-checking of conditions, all to better spot attempts at altering or bypassing safeguards (Figure 2).